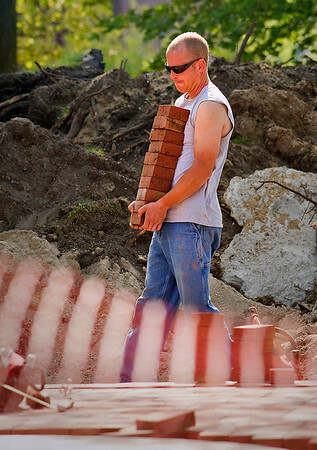 Mike Brooks of Milarch Brothers carries a stack of bricks to place in Traverse City's Lay Park as he and William Gray (not pictured) work a plaza that will be part of a memorial for former Downtown Development Authority leader Bryan Crough. The bricks used for the project are reclaimed, and benches and landscaping will be added once the brick work is complete. The two estimated they will have used between 3,200 and 4,000 bricks on the plaza when they are done this week.